Polly is out and about with her lovely pink stroller. She's still rocking the colour blocking trend and loving it. She is a bit of an attention seeker so it's perfect for her. The best thing about this outfit is it works for anywhere. Yep you can guess that I'm definitely lusting after this outfit! lol we both picked blue jeans & bugaboos. 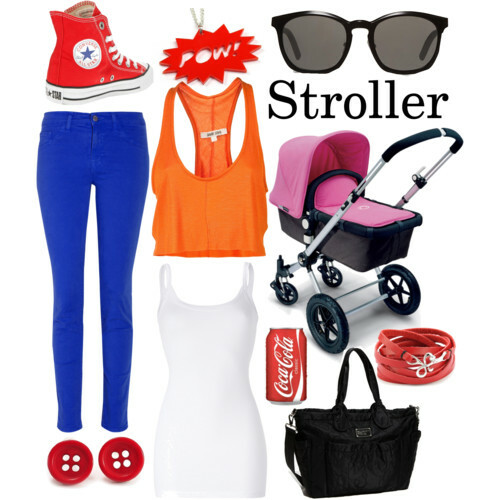 you can NEVER go wrong with Converse :) love the orange and the blue together! I love that you never seem to be afraid of colour - you rock those skinny jeans sister! Awesome - a colourful mumma! Funky and practical, go you!